One of the things I really love about Buddy is that he thinks things through really carefully. He is more likely to try and find a solution himself than ask for help, which is sometimes good and sometimes not hehe. 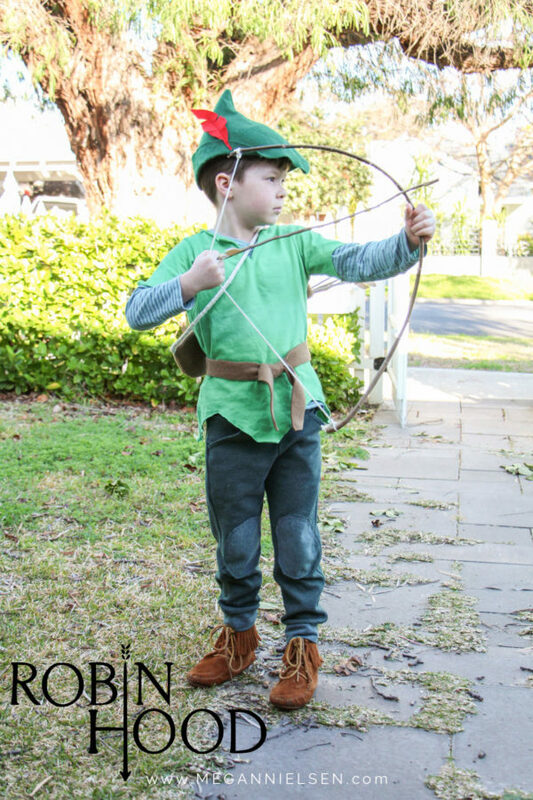 When the kids and I started to chat about Book Week costumes this week, Buddy didn’t really want to throw around ideas, so knowing he needs his own time, I left him to think about what he would like me to make him. To my great surprise he came back to me a few days later and told me he had figured out a costume using things he already had. I didn’t have to make a thing? 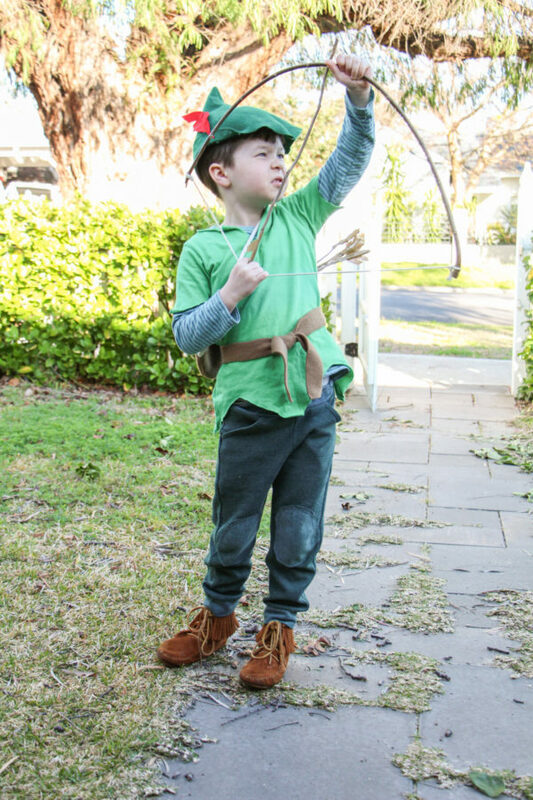 Enter, Robin Hood! 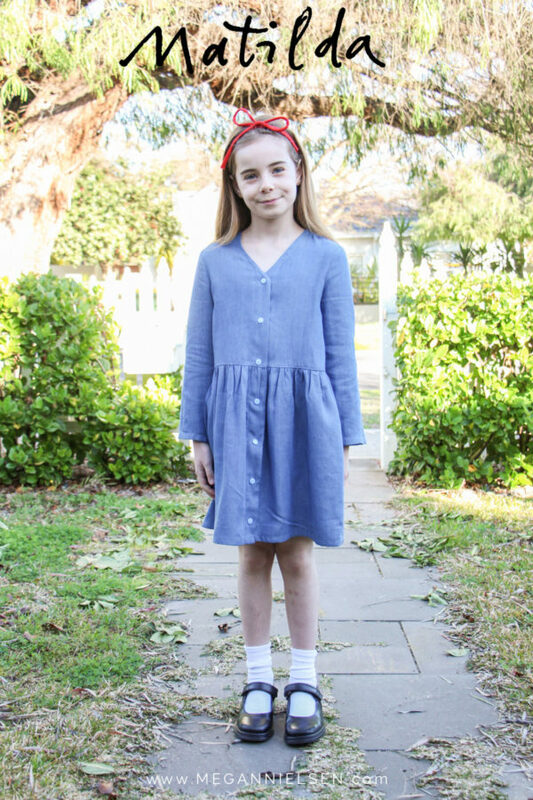 Bunnys Book Week 2017 costume: Matilda! And Book Week has come to Perth once more! 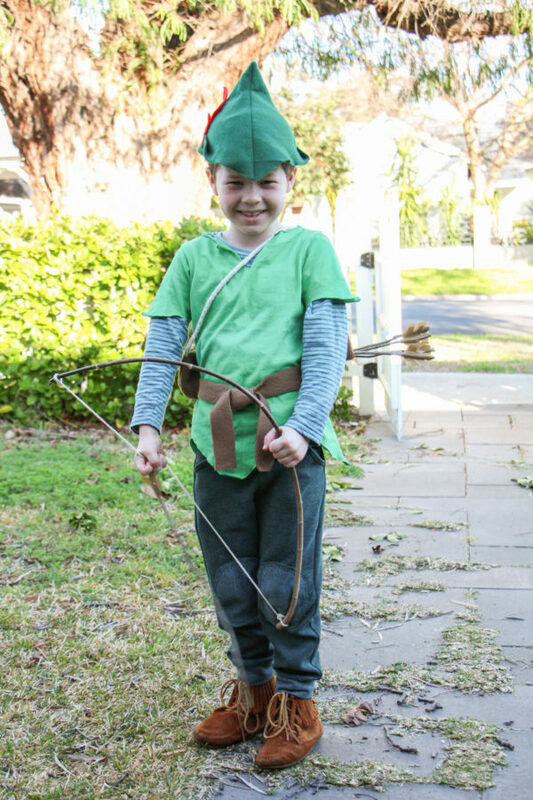 I love Book Week and the excuse to dress up as your favourite book character. This year Bunny decided she wanted to dress up like Roald Dahl’s Matilda, one of her favourite books. Though in all honestly, this kid is such an avid reader that she had a super tough time narrowing down who she wanted to dress up as. It went back and forth for days and days, but she settled on Matilda, deciding she liked the outfit best hehe. Do you ever have a sewing project where you feel like you are killing two birds with one stone? That is this dress. For absolutely ages Bunny has been pointing at the blue chambray Darling Ranges sample that hangs in my work room asking me to make her one in her size. I got part way through draft a pattern, and as per usual i got busy with work, and the project got pushed to the side. But this costume gave me the perfect excuse to try out the draft and finally make her the much requested dress. 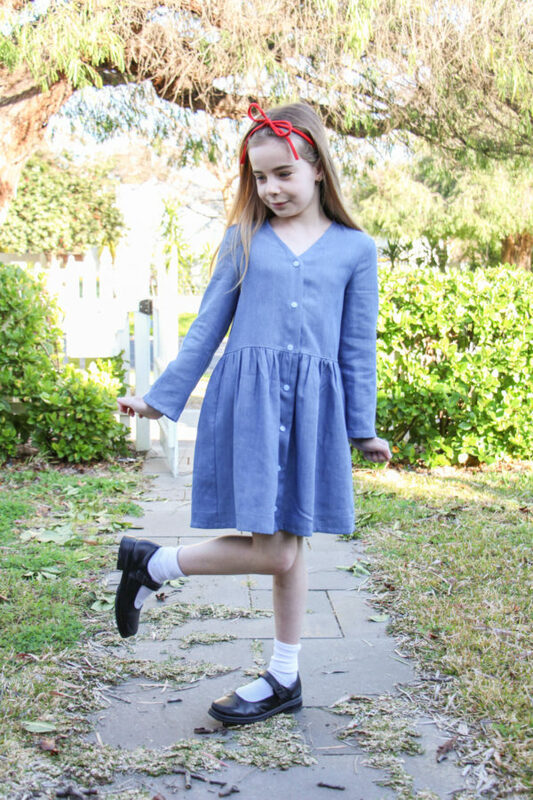 Given the fact I was making this dress the night before the school Book Week parade, i opted for snaps instead of buttons as they were faster. 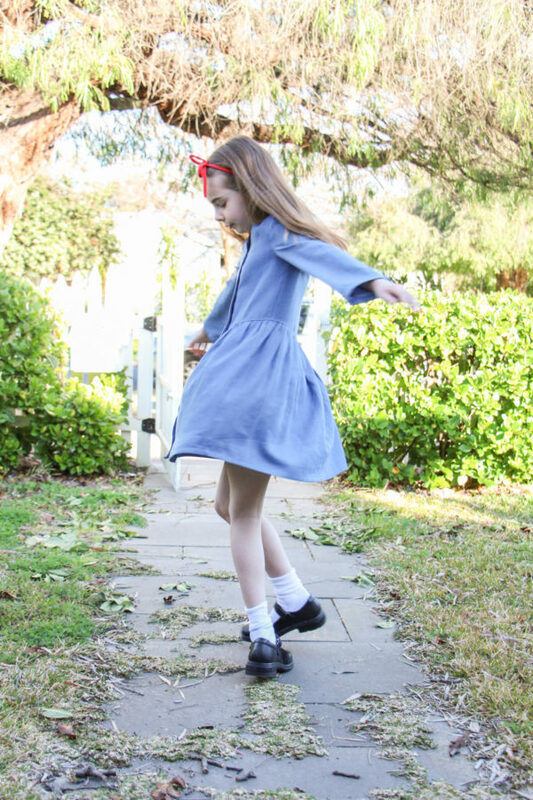 The happy accident here is that Bunny is really enjoying how easy it is to take on and off with the snaps – so maybe i’ll be doing this on all her dresses from now on! I’m so happy with how this first draft of this dress turned out. It definitely needs some tweaking, as the fit isn’t exactly where i’d like it, but regardless it’s pretty darn cute on my girl! Knowing she likes it so much has encouraged me to keep working on the pattern until it’s just right. 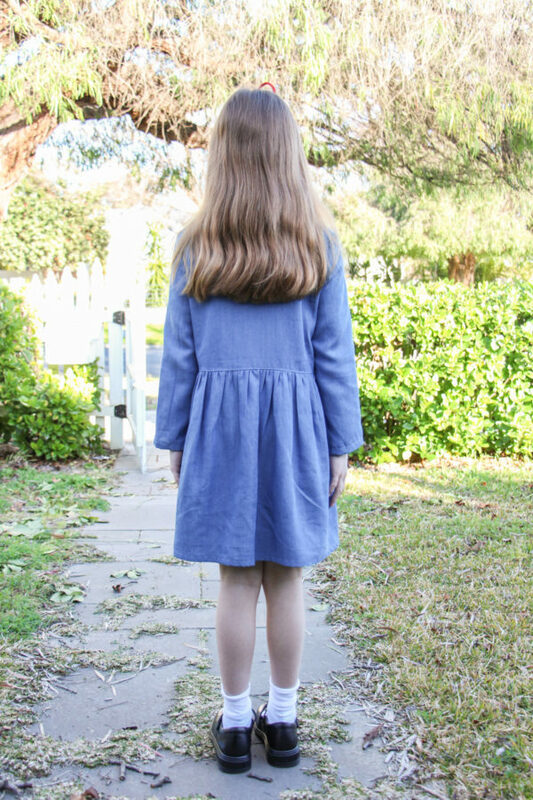 I honestly wish I had pushed myself to sew her this dress earlier, as she has worn it so much since i made it a few weeks ago, that I know she would have enjoyed having more of winter to enjoy it. The last minute rush sewing of costumes before the school book parade is always SO SO worth it when i get so see big happy grins like this afterwards! Bunny as you may recall if you’ve been ready this blog for a while, has loved My Little Pony for a loooong time and used to absolutely adore Rainbow Dash. She would dress up as Rainbow Dash for absolute hours, and insisted that she was actually her invisible friend. 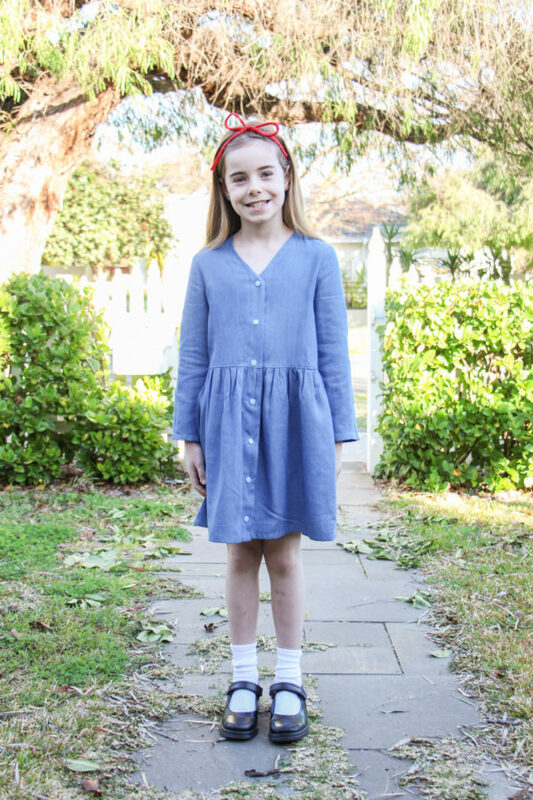 Then she turned 8 a few months ago, and around the same time became obsessed with reading. She will get stuck in a book and you just can’t talk to her because she can’t hear you anymore, she is in her own world. So i guess i shouldn’t have been surprised when she announced that Twilight Sparkle was her new favourity pony. It might be silly to pay so much attention to your child’s favourite pony, but her love of Rainbow Dash was always so telling of her personality, and this change really signalled to me a change in her perspective. She has taken turning 8 quite seriously, and I’ve noticed a real maturing in her too. I can see that this is a special age for her, and i’m trying my best to enjoy it with her and embrace the changes in her likes and dislikes without crying. Ok fine i cried hehe. So when it came time for her birthday party she asked me for a My Little Pony craft party. I think she made it up by mashing together her two favourite things, crafting and Pony’s, because i had literally never heard of this party theme before. I’m actually going to do a seperate blog poast about how i managed to sort that out, because it took a couple of weeks of Pinteresting and prepping to make it happen, but it went really well. 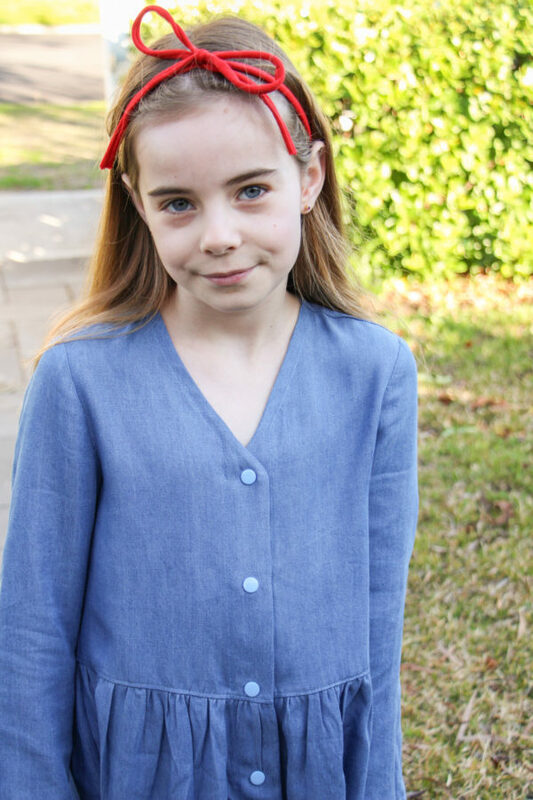 Anyway, she asked me to make her a Twilight Sparkle costume for her party – but not too much like a costume, because apparently she is “quite grown up now”. Her words. So cute hehe. I had a bit of a dilemma on how to achieve a costume that’s not a costume. Coincidently Bunny has a cat ear headband that she has worn to death and loves to don when she is being a cat (which is surprisingly more often than you’d think hehe), and that gave me the idea of making a Twilight Sparkle headband. Something she could wear as a birthday headpiece, but not make it a dress up event. 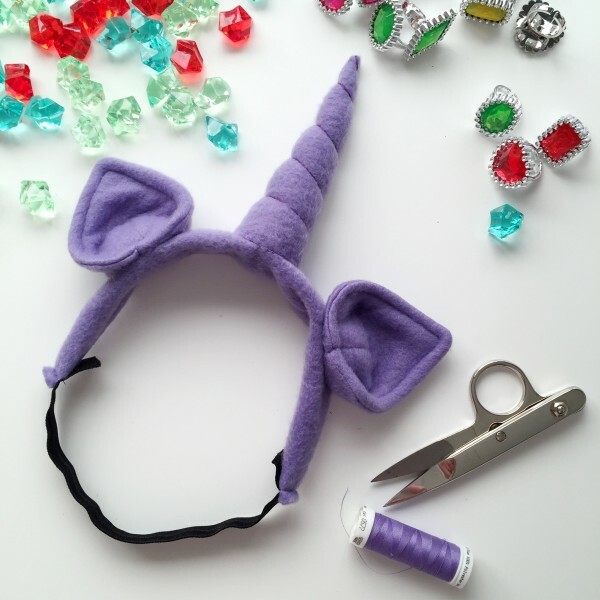 I turned to the amazing Toni at Stitch and Pink and her unbelievable My Little Pony costume tutorials. Please someone give this woman an award for her amazingness. 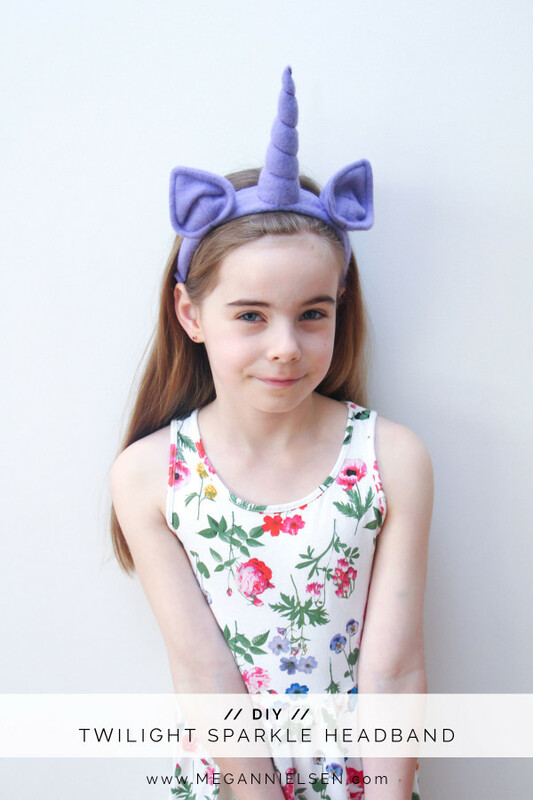 I used her free pattern for a twilight sparkle horn and ears and then hand sewed them onto a self drafted soft headband with elastic at the back. Her tutorial uses a hoodie sweatshirt and hairclips for the ears, but i knew this wouldn’t work well for Bunny. At first i tried glueing them to a headband, but Bunny is pretty fussy about headbands and i just couldnt’ find one that would fit the hefty horn and ears, and was still comfy to her. Stretch headband for the win. As a side note, when i was part way through sewing the ears and horn I started to really question the scale. The ears looked huge and the horn small and i was worried, but pushed on. Let me say this, trust the pattern. The scale is perfect, and i wouldn’t change a thing. So if you use this pattern, just trust it, Toni has it right :). This only took me a few hours to make, but I’m beyond thrilled with how it turned out. Bunny loves it so much, and it now holds the coveted position of hanging on the post of her bed. It seemed to hit the perfect balance for her desire to be a little bit dressed up but not too much. Thank goodness. Meanwhile, I can’t resist posting this little set of headshots – i started doing it for my kids a few years ago, as a way to document their different expressions at each age. I’ve loved it. It’s amazing to see how much they’ve changed and to compare their typical little looks. As a comparison point, here is Bunny at 5 when i started this, and woah the difference. 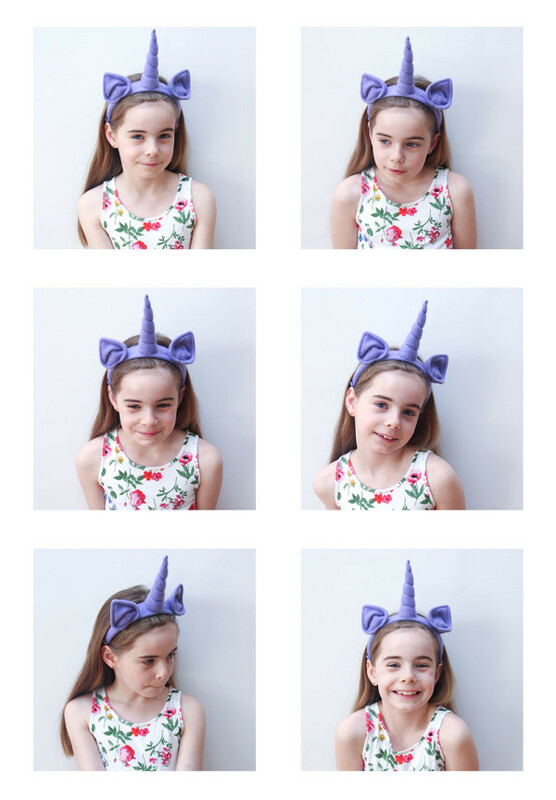 Bunny took me aback this time, because she tried so so hard to be serious and not be her typical nutty self – i think perhaps that’s part of growing up – but still, I am her mum, and I know how to get the big honest to goodness REAL grin. One of the things i have always loved about my kids is how individual they are – and Buddy, that is him 100%. 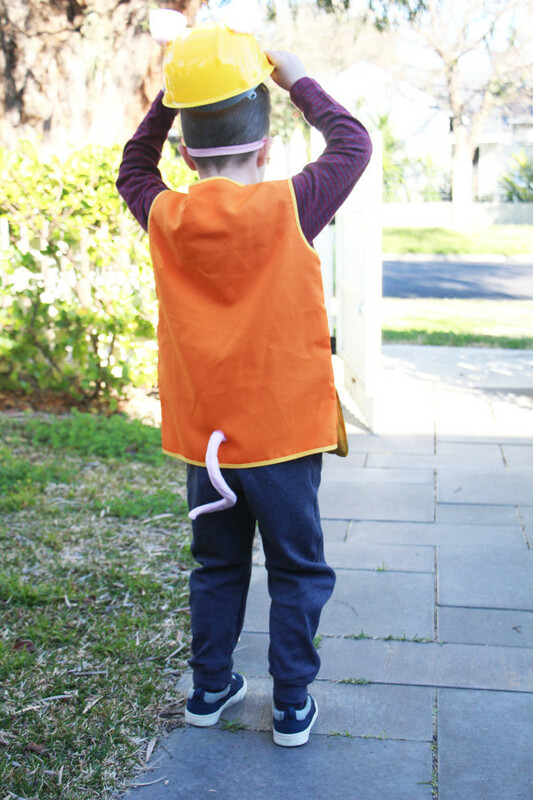 This year the second bookweek was talked about at school, he came home declaring he wanted to be the third little pig. 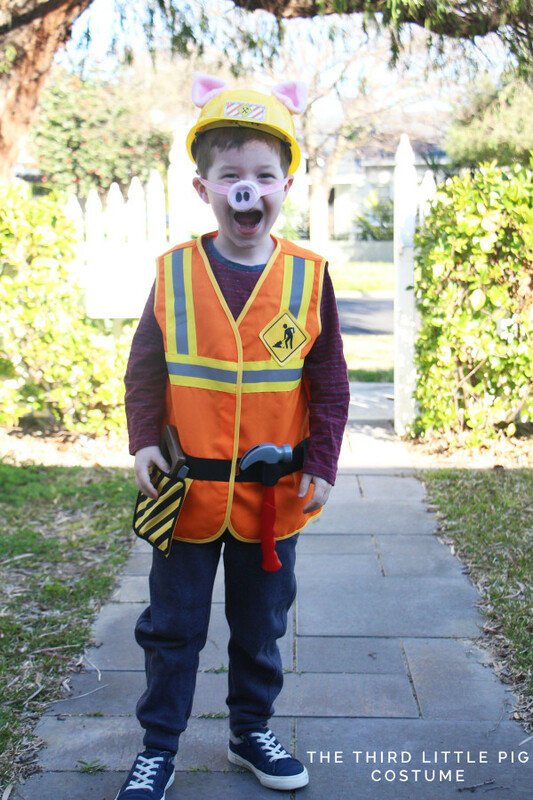 I was confused, so he explained that he wanted to be the third little pig in the Three Little Pigs and the Big Bad Wolf – the smart one, the one that builds his house out of bricks and saves the other pigs and beats the wolf. Honestly, this kid can talk me into anything, and he made me love that story i’ve heard a million times, all over again. Suddenly the third little pig sounds like this amazing hero. Nice work dude. Now here i must admit i struggled at first on how to achieve this costume. 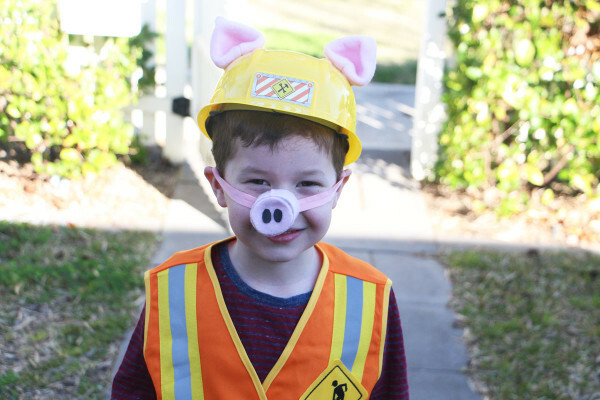 Buddy wanted a construction hat, and a full pink pig costume. 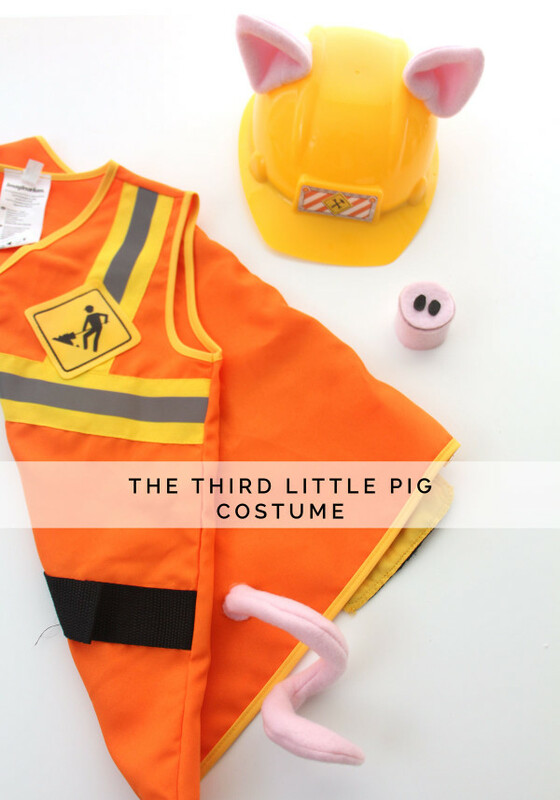 I just couldn’t bring myself to make an entire full onesie style pig costume, I was coming off an epic month long stint of sample sewing and i was really exhausted. So i decided to leave that part to figure itself out in the back of my brain, and began the hunt for a construction hat. It took a couple of stores, but finally i found a construction costume set at Toys R Us. I don’t think i’ve ever loved a toy store so much (i hate toy stores). 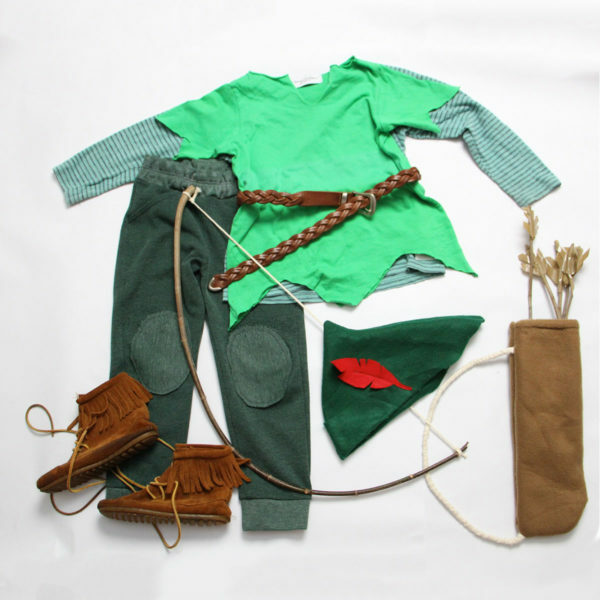 The second i found the set, i knew how to make the rest work – it included the hat some tools and a vest with toolbelt. I went straight home and made a tail which i hot glued to the back of the vest, ears which i hotglued to the hat and a piggie nose. Something i had stressed about for two weeks came together in a day, and i was so pleased! 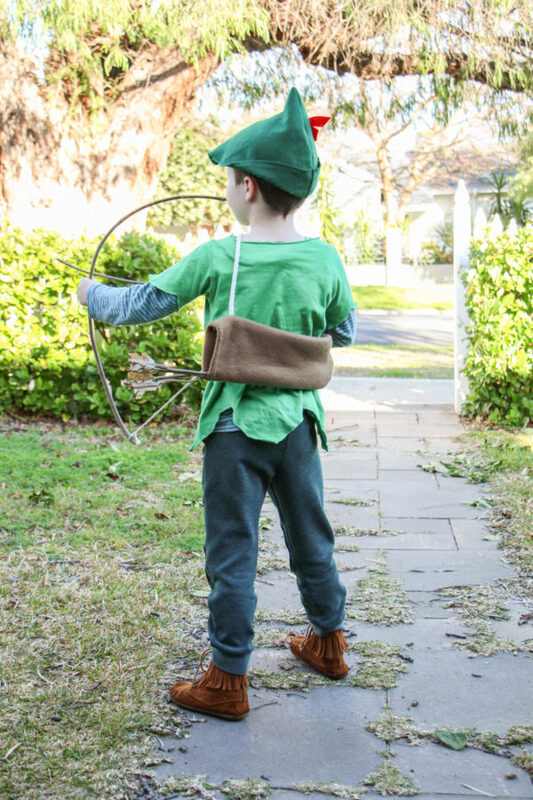 The nice thing about this costume, was that he was able to wear it over normal clothing – which meant when he got tired of being dressed up (which i believe was approximately morning tea time hehehe) he could take off the hat nose and vest and be comfy in his regular stuff. Ears / i used pink fleece and then hot glued the ears to the hat. This tutorial is actually for My Little Pony ears, but i honestly think it works perfectly for pig ears too. Nose / i used pink fleece, a toilet role, fold over elastic and black leather for the nostrils. oh anda lot of hot glue! Tail / i used the same pink fleece as for the other parts, and i also made mine shorter as it was quite long. This tutorial also includes instructions for an entire ridiculously adorable pig costume, but it was too girly for Buddy. I then hot glued it to the vest. This is a really similar construction worker costume. I am incredibly grateful to the lovely bloggers who made tutorials for the various components and generously shared them on the internet. Sometimes i wonder how i’d figure stuff like this out if i didn’t have the internet! 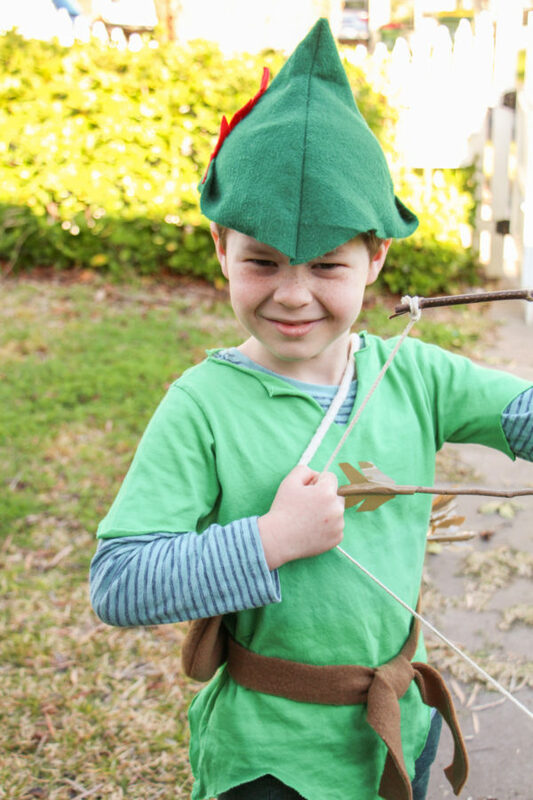 What did all of our mothers do when they had to make us costumes?! 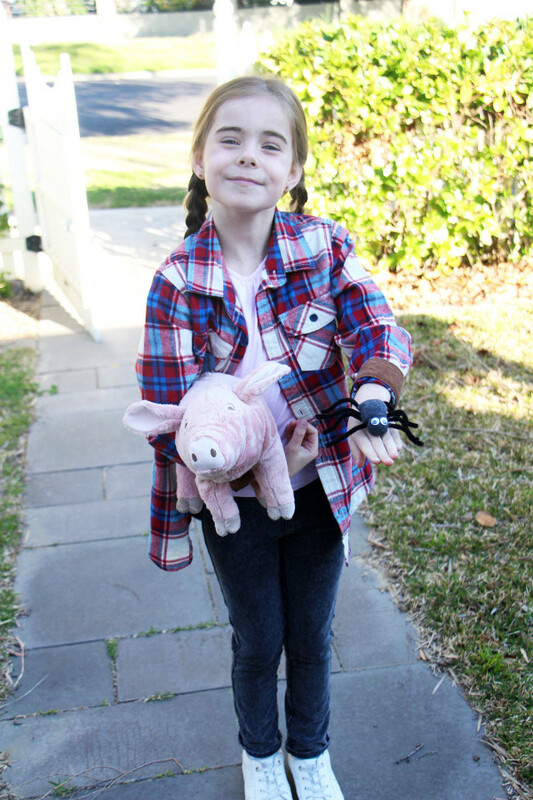 Now that book week is over Buddy has requested that i take the costume apart so he can have a pig separate to a construction worked – so i guess i have some more sewing to do!!! 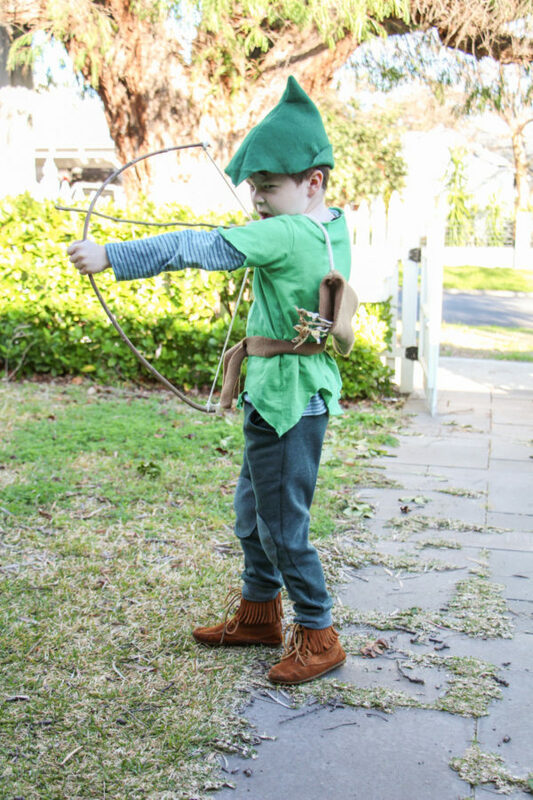 Last week was bookweek for my two big kids, and seriously I love book week. I always have a bit of a panic attack about making costumes at short notice, but at the end of the day, i really love it. This year – I got really lucky with Bunny. 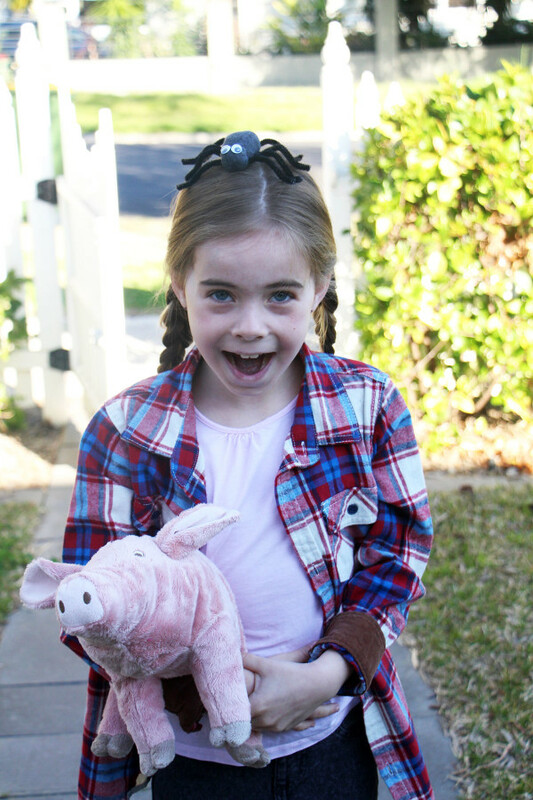 My darling girl is usually quite specific and complex in her costume demands – but this time, she wanted nothing more than to be Fern from Charlottes Web. This was possibly the easiest costume I’ve ever had to throw together for her. Almost zero panic sewing! The only thing i made was the big Charlotte spider which is a just two balls of fleece sewn together with pipe cleaner legs and googly eyes. Wilbur is a soft pig from Ikea (which Bunny has taken to sleeping with at night, honestly could she melt my heart more?). 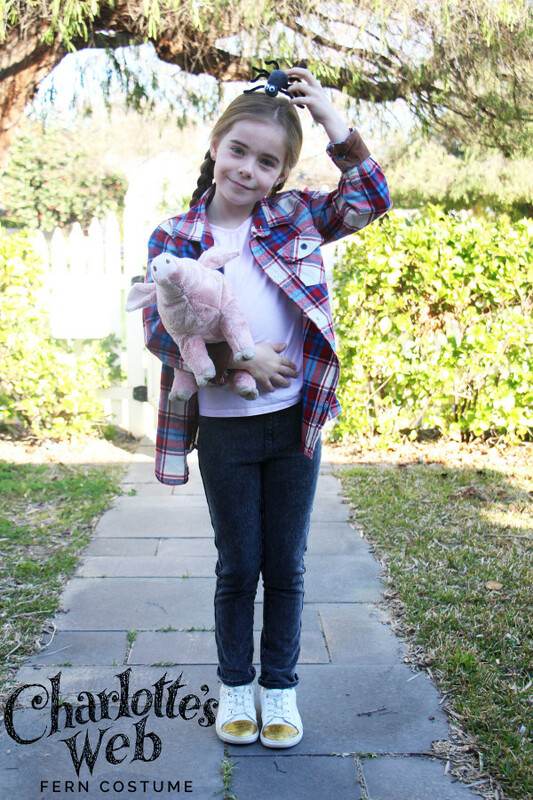 The Jeans and tee are both from Pumpkin Patch, which she already had, and the flannel shirt is also from Pumpkin patch and i bought it the day before. Her shoes are her current favourite, DIY glitter capped sneakers! How easy was that? Thanks for being awesome and low fuss Bunny!